NAY PYI TAW, Nov. 7 (Xinhua) -- China hopes to strengthen with Myanmar on the construction of the two countries' economic corridor under the framework of Belt and Road Initiative, head of the International Department of the Central Committee of the Communist Party of China (CPC) Song Tao said here late Tuesday. Song made the remarks when he met with Chairperson of Myanmar's National League for Democracy (NLD) and State Counselor Aung San Suu Kyi in Nay Pyi Taw. Song said China attaches high importance to the development of China-Myanmar relations, and called for practical cooperation in all sectors to better serve and bring the well-being to the two peoples. He said the CPC would like to deepen the exchange and cooperation with NLD and push ahead the healthy development of relations between the two countries. Valuing the Myanmar-China friendship and thanking China for its selfless assistance, Aung San Suu Kyi said Myanmar is willing to push forward the cooperation of the two countries in major projects implementation and exchanges between the ruling parties to promote the development of bilateral ties. 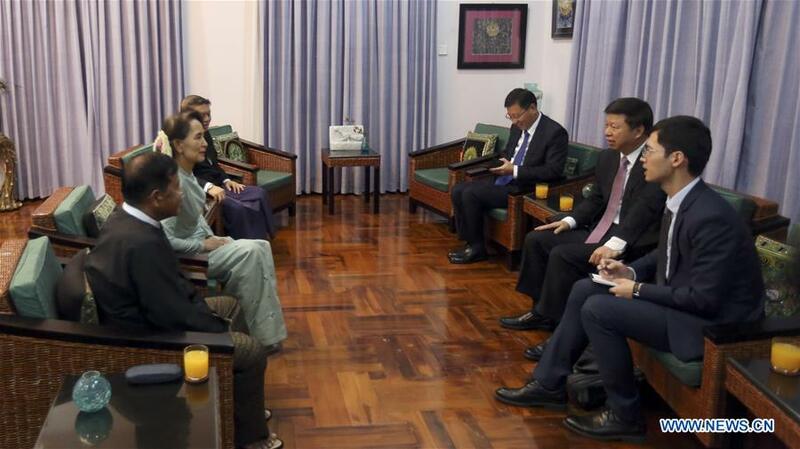 Song also met with leaders of the Union Solidarity and Development Party (USDP) and the military of Myanmar.